View of Union Iron Works from the Bay, c. 1890s. Striking workers about outside office building of Bethlehem Steel at 20th and Illinois, January 1941. Striking Bethlehem Shipyard workers outside offices on 20th near Illinois, 1945. In a city that made a mall out of a chocolate factory and lines its historic fishery with wax museums, Pier 70 is perhaps the best place to see the old San Francisco -- the blue-collar port town left to die, but still breathing. Between the high-tech, half-built glass structures of Mission Bay and the toxic, closed-down military base at Hunters Point, the bay shore makes a slow curve. Here, at the base of Potrero Hill, the new economy of biotechnology and baristas almost touches what remains of the world of giant industrial ships and machinists. In old photographs of Pier 70's glory days from the Maritime Museum Library, wood scaffolding towers over the building blocks of a 1945 destroyer, workers scattered around the dock next to the ship. Debonair women holding roses pose in giant hats next to the finished military vessels. 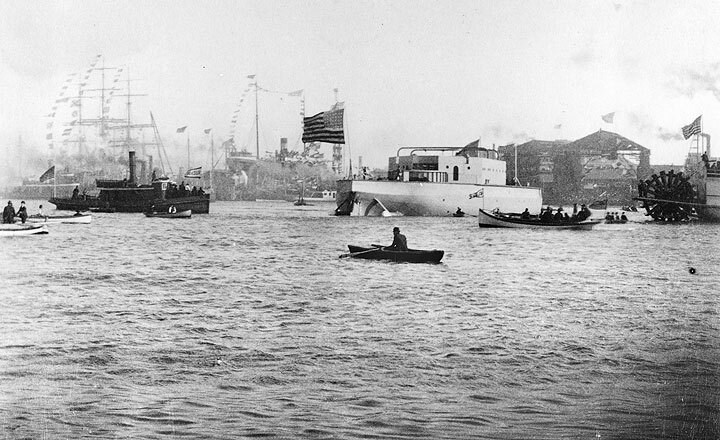 (Above) Launch of the USS Monterey from the Union Iron Works, April 28, 1891. A riveter identified as Joseph Torres holds a piece of metal against a drilling machine in 1918, on the day he was named the "Rivet Champion of the World" after his team had driven 6,075 rivets in a single day. Thousands of cheering workers fill the spaces between the buildings and hover on the rooftops to catch a glimpse of film star Mary Pickford at a World War I-era pep rally. Comparing then to now, you might make the easy first assumption that Pier 70 -- today littered with old tires and pulleys and slabs of metal, empty warehouses covered with graffiti and blasted out windows, and railroad tracks that go nowhere -- is a ghost town, a mausoleum holding San Francisco's rich past. But spend some time there, and it will start to look quite different. You'll find people like Cielito Balantae, who works in the stateroom of the cruise ship Infinity, asking for directions to downtown and lamenting over lost tip wages since the ship broke down the other day. Or Jim Heryford, a plumber working as a pipe-fitter on ships now, a position he sees as a step down. Or Ari Nelson, a Coast Guard member working on the interior repairs of his boat while the dockworkers sandblast the outside. 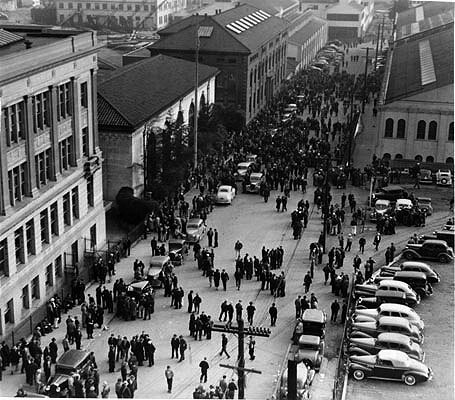 You'll find these workers signing in and out at the gates of San Francisco Drydock, Inc., the vastly scaled-down remnant of the teeming shipyards of yesteryear, but a reminder still that San Francisco's past is not entirely gone. The shipbuilding business has closed, but there are still a few hundred ship workers here in one small section of the pier, doing mainly repair, chiefly for commercial ships. Old cranes near 20th and Illinois, long out of use in this 2010 photo. Old-timers might remember United Iron Works or Bethlehem Steel. 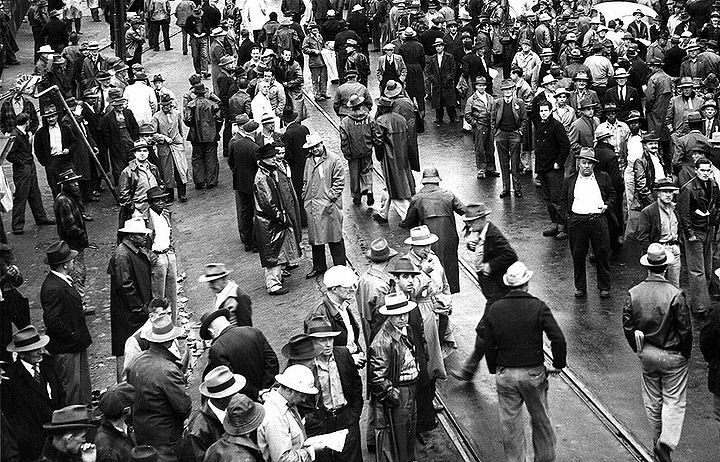 They might know that Pier 70 was part of the nexus of shipyards, including Sausalito, Richmond, Alameda, Oakland, Mare Island and Hunters Point, that made the Bay Area one of the great shipbuilding centers of the world. It began more than 150 years ago. One clear Sunday in 1850, Peter Donahue, founder of United Iron Works and one of San Francisco's early industrial titans, climbed to the top of the sand hills in the southern part of the city and, looking out across the peninsula, was struck by what he saw before him. "This is going to be a great city at no distant day. There will have to be gasworks and ironworks here, and whoever has the faith enough to embark on either of these enterprises will make great money from them," Donahue reportedly remarked to a friend. Irving Scott bought United Iron Works in 1865, and steered the iron foundry into the shipbuilding industry, recognizing that "transportation on the waters had been neglected." Perhaps what Scott was most prescient about was the fact that the floundering nation would soon grow into a major military power, and that much of that power would come from ships. Who better to capitalize on the growing market than an iron company in a Pacific Coast port? The next industrialist to partake was Charles Schwab, who ran Bethlehem Steel, the company that bought United Iron Works in 1905. Bethlehem Steel reached the height of activity during the two world wars. During World War I, the San Francisco yard employed 16,000 people and built 84 ships for the Navy. After World War II, shipbuilding declined, and the primary role of the yard was repairs and alterations. 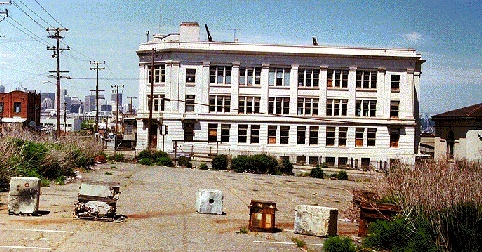 The last two ships built at Pier 70 were two U.S. Navy frigates, the Bradley and the Garcia, between 1962 and 1965. The yard also got a huge job when it was commissioned to build 57 steel sections for BART's underwater tunnel between Oakland and San Francisco. Todd Industries, at one time the largest ship company in the country, bought the shipyards in 1982. But by 1987, Todd, facing bankruptcy, broke its lease with the port and abandoned the property. 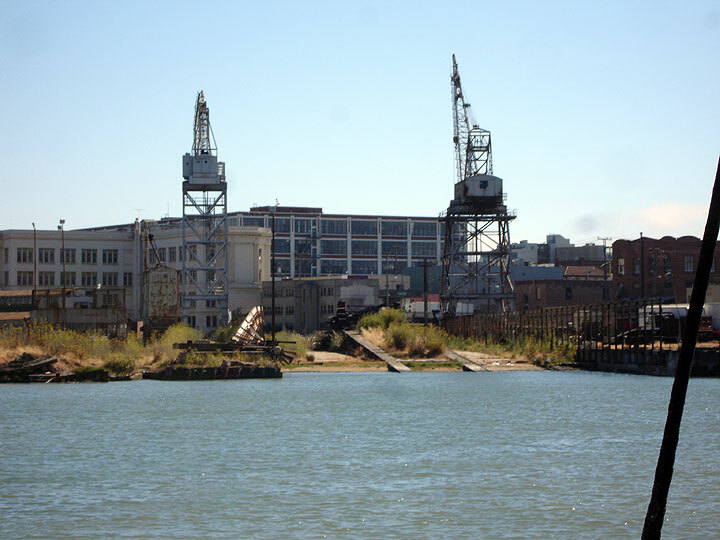 San Francisco Drydock Inc. eventually leased the land and bought the dry-dock facilities from the port for $1. By then, with shipbuilding no longer viable, most of the old buildings had been abandoned. For Pier 70, all of this has meant a mostly barren landscape with a treasure trove of buildings left behind -- and a unique set of challenges. 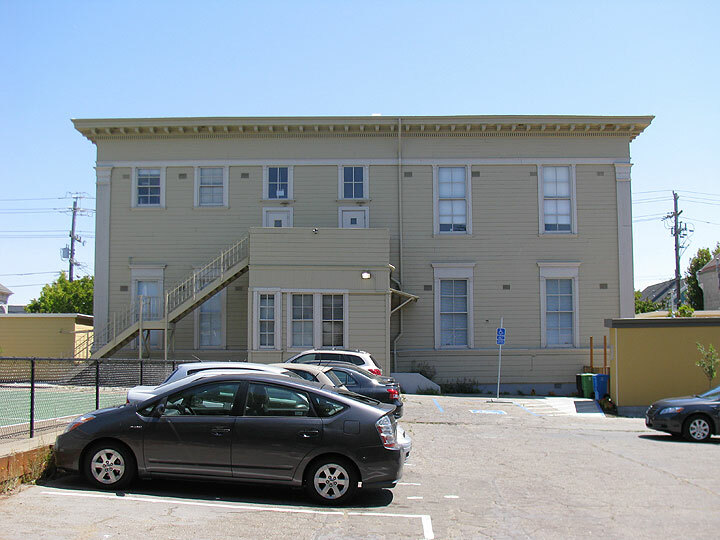 "As we've been working on this site, we've fallen in love with the historic buildings," says Lynda Weisberg Swanson, the Port of San Francisco project manager in charge of planning Pier 70. "They're generous spaces, absolutely dazzlingly beautiful and completely unique. These buildings tell the story of how the West was built. So here we have something quite wonderful and special, but it will be very expensive." A plan to develop the site as an artist and nonprofit community fell through after the dot-com crash. 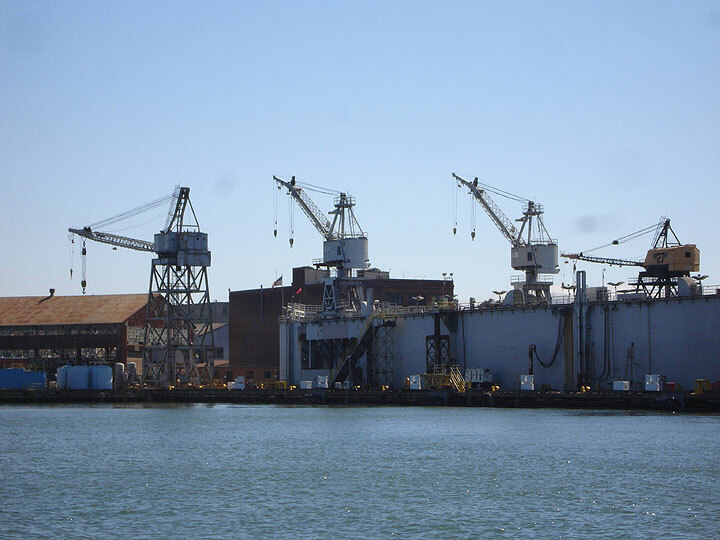 Now, Swanson says she would like the dry docks to stay, but the Port has not discussed long-term plans with San Francisco Drydock, Inc.
Swanson says, "Having those huge ships there is special. People can see how a rough and ready industry works, and it's a little bit of history. "San Francisco started as a port and was a huge water-oriented enterprise until the '40s. People who live closest to it have long memories of it being a really vital place, and there's a lot of desire to not turn that into a faux historic site, to keep it authentic, to not become Disneyfied." Another challenge is the old machine shop. Built in 1886 and located directly across from the dry dock gates, the striking red brick structure was used continuously as a machine shop up until last year, when it was deemed seismically unsound. Swanson explains that it was built with unreinforced masonry. The building also has extensive water damage and possibly asbestos. The roof alone is expected to cost $2 million to repair. Swanson says her dream project for the machine shop would be a museum of Western American industry. "The big lays and cranes are still there, so it wouldn't take much to reproduce the atmosphere of a machine shop," she says. Swanson is perhaps right that the day may not be far away when we will need a museum to remind us what industry in San Francisco looked like. Old cranes still haunt the shoreline at the old shipyards in this 2010 photo. But right now, you can still get a little taste of the real thing at the dry docks. Follow the white lines from the guard station down to the docks, turn a corner, and suddenly, the ships come into view. The Infinity towers over Drydock No. 2, the bigger of the two dry docks. The ship, a luxury liner owned by Celebrity Cruises, has what looks like a giant red nose that juts out of the front from the bottom of the ship and curves upward. Celebrity Cruises' Web site highlights the ship's marble walls, polished granite decks and opulent suites. "Infinity's reason for being," it says, "is simply to indulge and pamper you." Shipyard workers are still at Pier 70, although perhaps not for long. In the 35 years Juan Ramirez has worked in the San Francisco waterfront as a machinist, he's seen thousands of ships come in and sail away again. Tall and grizzled but looking far younger than his 77 years, he says he has no plans to retire. "I would miss the shipyard," Ramirez says. "I would miss my friends, getting mad, getting happy. I don't want to be in the house in the rocking chair." But Ramirez is working in a field that is closing up around him. "There used to be a lot more work. There used to be a lot more money," he says. In what was once a steady profession, Ramirez, like most of the dockworkers, now works just six months out of the year and collects unemployment the rest of the time. 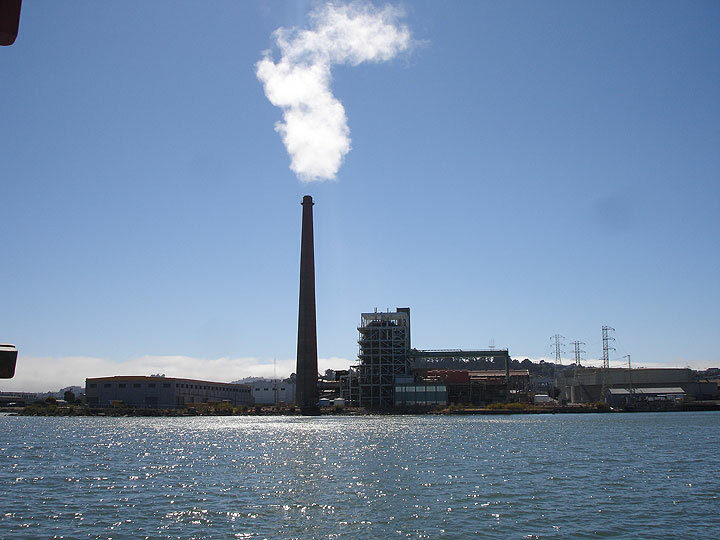 The last operating power plant in San Francisco, running on the shoreline near Dogpatch and the old shipyards, owned at the time this 2010 photo was taken by Mirant Corporation. For the big picture, of course, you can look to globalization. True, as we become more of a consumer and less a producer society, we need more ships to handle imports coming in all the time from other countries. But that globalized economy has also meant that the ships bringing in the goods can be built in other countries too. For the dry docks, which have historically relied on military contracts, a big factor is the declining role of ships in U.S. military strategy. The first issue of the Bethlehem Star, the employee newsletter printed June 1918, has a picture of Bethlehem Steel director Charles Schwab on the cover. His head far larger than his body and sporting a top hat and a tuxedo, Schwab stands on top of an outline of the United States, a baton in each hand pointing to the oceans around the country, which are filled with tiny ships. The caption under the picture reads, "Director General Schwab says 'Ships Mean Victory.' "
Today, the Navy is down to 288 ships, from 590 ships in the 1980s. In the Bay Area, most of the military ship repair contracts dried up more than a decade ago with the local naval base closures. But instead of closing up, the dry docks have come back somewhat. Cruise ships have been a big reason for that. "It's nothing but bright right now for the cruise ship industry," says Mike Hardigan, vice president of the Port Commission. The port plans to build a new cruise ship dock as part of its $261 project at Piers 30-32 to accommodate at least 84 cruise ships a year. "The cruise ships can unload passengers and schedule a dry dock (repair) at the same time," says Hardigan. The cruise ships that provide the port one remaining connection to its maritime past are a far cry from the cargo carriers that once dominated the city's waterfront or the military ships that were built here. While the Navy markets itself as a "life accelerator," cruise lines sell themselves as a life de-accelerator -- relax, unwind, indulge. Yet, in their own way, the passengers lounging in the Aquaspa on the top deck of the Infiniti are helping to preserve a bit of old-time San Francisco, the scrappy blue-collar town without a single T-shirt for sale at its fishing pier. Alexandra Berzon was, in 2005, a student at the UC Berkeley Graduate School of Journalism. She is spending the summer at the Anchorage Daily News. This article appeared originally in the San Francisco Chronicle, Insight section. A strike begins at the Union Iron Works at the foot of Potrero Hill in 1917. Unskilled workers at the Union Iron Works went on strike in 1917 in solidarity with their counter-parts at Iron works in Oakland. They were seeking an 8 hour day and basic wage increases. If one person could be considered as a major contributor to the development of the Potrero, it would be Irving M. Scott. Scott was born of English stock on Christmas day in 1837. After working in his chosen profession, engineering, on the East coast, he moved to California. He obtained a position as a draftsman at the then small Union Iron Works, known at that time as H.J. Booth & Co., and later as Prescott, Scott & Co. By 1861, Mr. Scott had become a partner, and under his management, the company became the Union Iron Works. Although a major shipbuilder on the coast, Scott also worked on engines for commercial use. Many of his engines worked in the Comstock Mines. While helping the Potrero grow in jobs and income, Scott also realized the great need for better education. This prompted him to lend financial aid to the schools of the area. The grateful citizens repaid him by naming a school after him. The former Irving M. Scott School, now in private use, 2012.